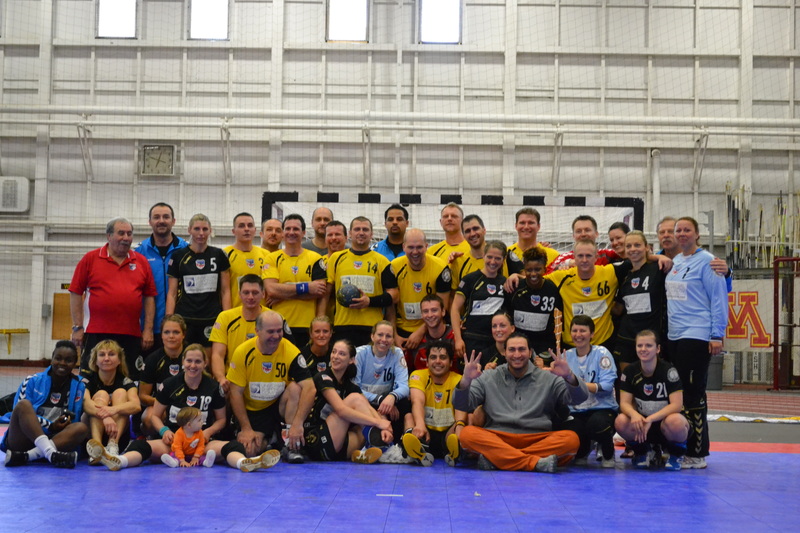 The 2012 Handball season ended with the annual National Championships, this year hosted in Minneapolis, MN. The women fell one goal short of a repeat, falling to the ladies of the Alberta Senior team, 24-23. The men bounced back from their difficult second day, to win the 3rd place game for a bronze. The women began the weekend by defeating West Point Blank handily, 27-9, before squaring off for the first time with the highly anticipated Alberta senior regional team. “We were looking forward to playing them. We didn’t know anything about them, but expected them to be strong. It is always more fun to play a really competitive team,” said goalie Jacque Messel. Irina Irimia lines up for a deadly jumpshot. “I predicted an even score with Alberta in our pool and this is the reason why I asked the girls to win our first game with WP by 16 goals, since Alberta beat them by 15,” mused Coach Felix Murokh. The scoring margin against West Point would prove Coach Felix’s predictions correct and Inter took the top seed at the end of pool play. Inter would begin the crossover games on Saturday against the California Smurfs, handling them with relative ease: 21-7. As expected after their initial meeting, the final would be a rematch with Alberta. Fighting fatigue and injury the Inter ladies battled the Canadians in another closely contested match. Chicago committed two serious fouls in the final minutes, losing a player to a red card and another receiving a 2 minute penalty. This would prove their undoing and shut the door on their attempt to garner back to back national titles. “The final game was the most painful. We could win that game… but talent alone is not always not enough. I hope next year we can perform better and we can hold the trophy in our hands,” reflected team captain Jolanta Kunickaite. The men’s team also put on a strong showing to take 3rd. They started strongly, winning both of their games on Friday. They would suffer set backs on Saturday falling to Boston HC and then later the eventual champs, New York City. The men would rally on Sunday to just edge out Boston for bronze. Men’s coach Pawel Gryc recognized by the USA Team Handball Federation as the oldest active player. Though he did not participate in this tournament, men’s coach Pawel Gryc was recognized by the USA Team Handball Federation for being the oldest active player amongst the USATH membership. Pawel still regularly outruns people half his age at practice and we think he has another 20+ years in him. Congratulations to both teams. Rest up during the summer, we’re looking for great things in the 2012-2013 season.